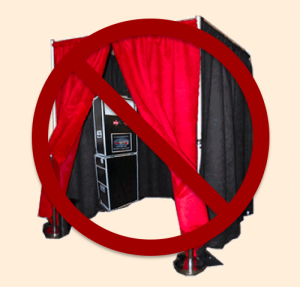 What is a Pipe Drape Photo Booth? Pipe Drape Photo Booth is the new term for a FAKE photo booth. Also it is simply made out of pvc pipe or metal piping surrounded by some kind of drapery whether it be velour or otherwise. The whole concept of what a photo booth really is completely lost. This is the same set up used by photographers to shoot in front of the camera. These companies use a store bought digital camera connected to a home office inkjet printer that is often placed outside the set-up on a table. Even $300 is too much for these pipe drape fake photo booths.. Most importantly they use the low quality printing equipment and the pictures taken in these booths WILL FADE. I know I’d be incredibly disappointed if I paid money for pictures that weren’t going to last, wouldn’t you? Also during our research we even saw some companies who used a printer available at Target for $150.00. If this is what you want at your event, you are better off buying your own camera, printer and computer. At least you would get to keep the equipment at the end of the night. Beware of companies who tell you they use archival ink as an argument against fading pictures from pipe and drape photo booth.. Archival ink loses it’s ability to resist fading once it’s printed on glossy paper. There are many companies out there renting, “Photo Booths,” for around $500 or even less. It’s important to wonder, why such a low rate in comparison to other companies? The answer really is quite simple…you get what you pay for! Often times, companies offering such a low rate are either unreliable, are not providing professional quality equipment (pvc pipe and drape/inkjet printer), or are even scam efforts! OUR digital photo booths are not made of pipes and drapery, but rather, are legitimate photo booths with solid exteriors. They have a built in commercial use camera and a top of the line dye-sublimation printer. The printer can produce 2 photo strips of 4 pictures per session, or size 4″ x 6″ on high quality photo paper. By legitimate, I mean that you get in, close the curtain, take your photos, exit the booth and wait. The photo booth will process your pictures with there is no person involved in the process. The friendly attendant is ready to help if needed. When we prepared to deliver the photo booth – we call each venue and figure out how we can get into the venue and how we can exit the venue. We do not have any hidden fees. Our contract is short and fully states our responsibly in providing you excellent service. Some companies charge additional fees for duplicate photos, if photos go over a certain number, how soon you make the reservation, and more. The clients can come into our office in NJ or CA and see our photo booths. You should be selective about the particular photo booth they’d like – after all it’s YOUR special day and you should get what you want. Provide the honest services in NJ, NY, PA, CA bring to certain rentals may be slightly more expensive than these pipe and drape replicas. We provide REAL photo booths and not makeshift DIY setups. You can ask for pictures of the photo booth you will be getting on your event. You can see right away if you getting the Pipe Drape Photo Booth. Visit the company’s office to see the photo booth. Get details on how the photos print, including what type of paper and ink it uses. Check for previous client reviews and testimonials. Ask for hidden fees and any potential additional charges. Check the contract before you commit to a company, you never know what you’re getting yourself into. Finally ask about spare parts where applicable, some companies send their photo booths out without spare parts!!! !